Blackjack Knives was founded in 1987 in Los Angeles, California, by Mike Stewart and his wife Lesley. Mike wanted to import and sell Chris Reeve’s range of South African fixed blade knives as well as produce their own knives. In 1987, Stewart designed and released Blackjack’s first knife called “Mamba”. Unfortunately, the company went bankrupt the same year because of poor management. However, Blackjack managed to recover later and moved their production to Seki City, Japan, where Mike’s knives were produced by the Kencrest Corporation. Although the knives were of superior quality, Blackjack had some issues with the Japanese producers and in 1991 the company moved its production back to the United States and set facilities in Effingham, Illinois. In 1997, the Stewarts sold Blackjack Knives and moved to Escabana, Michigan, where they founded Bark River Knives. For several years, Blackjack Knives were produced by Knifeware, established in 1998 by Ken Warner, a member of the former Blackjack team that was located in St. Elmo, Illinois. After Ken Warner sold that enterprise, the Blackjack name was acquired by knife wholesale distributor Blue Ridge Knives. The knives are currently made in Michigan by Bark River, coincidentally owned and operated by the original founder of Blackjack Knives. Today, the assortment of Blackjack brand includes tactical, military, hunting, outdoor and self-defense knives. 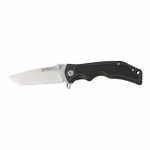 Their blades are made of tough carbon tool steel and handles fit against aluminum fittings. A few classic Blackjack models are still produced, including the Model 1-7 and Model 1-5. Below is a chart showing the best Blackjack Knives knives on the site as reviewed by multiple users. Keep in mind that there are many great Blackjack Knives knives out there, but if you can't decide on one after searching the site, choose one off this list and we are confident that you will be happy!